Thanks to everyone who participated in our Scrambles event! The weather definitely did NOT cooperate, but we really enjoyed the ground coaching and we’d like to extend a Spaceland-sized THANK YOU to all the more experienced jumpers and teams who took the weekend off AND braved the rotten forecast to help the younger jumpers learn. That’s what it’s all about! 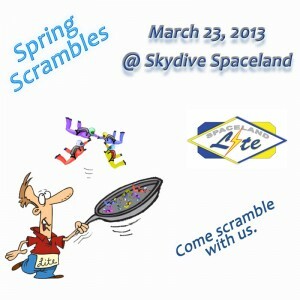 Spaceland Lite is going to host this 4-Way Formation Skydiving Scrambles Event. Teams will be randomly selected from individually entered skydivers of all experience levels. Jumpers of all skill and experience levels that have an interest in 4-Way Formation Skydiving are encouraged to participate, although anyone with less than 50 jumps should contact a Spaceland Lite member to participate. Some belly-flying formation experience is strongly recommended and a suit with grippers is required. This is a great opportunity for newer jumpers or even experienced skydivers that have never been on a team to try out this discipline with some of the many skilled team jumpers that call Spaceland home. We already have commitments from many of the top team jumpers to support this event. Registration will close promptly at 8:30am on Saturday morning of the event – latecomers will not be able to join the event mid-day because teams will already be formed and jumping so please be on time. Cost will be a $26 registration fee per person plus regular jump ticket prices for each of the planned 5 rounds of competition jumps. All jumps will be from full altitude (13.5K) with 50 seconds of working time. Video will be provided for all of the jumps and each team will receive free coaching from an experienced captain and judging by USPA-rated judges. For anyone interested in forming a team for this season, Spaceland Lite will hold a brief seminar on team building after the meet for interested parties. Refreshments will be available after the last load of the day.